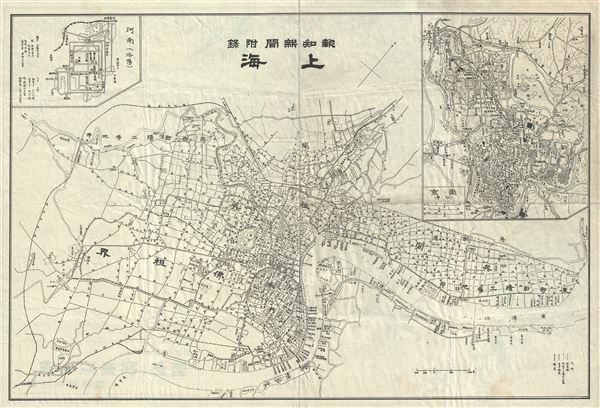 This is a scarce 1932 or Showa 7 Japanese map of Shanghai, China. Published by the Yubin Hochi Shimbun (Mail Reporting News), it depicts the city of Shanghai in great detail, with the various concessions all clearly labeled. Two inset maps are included in the upper left and right quadrants. All text is in Japanese. Issued by the Yubin Hochi Shimbun (Mail Reporting News). Yubin Hochi Shimbun (Mail Reporting News), Japan. Very good. Minor wear and toning along original fold lines and over margins. Minor spotting.